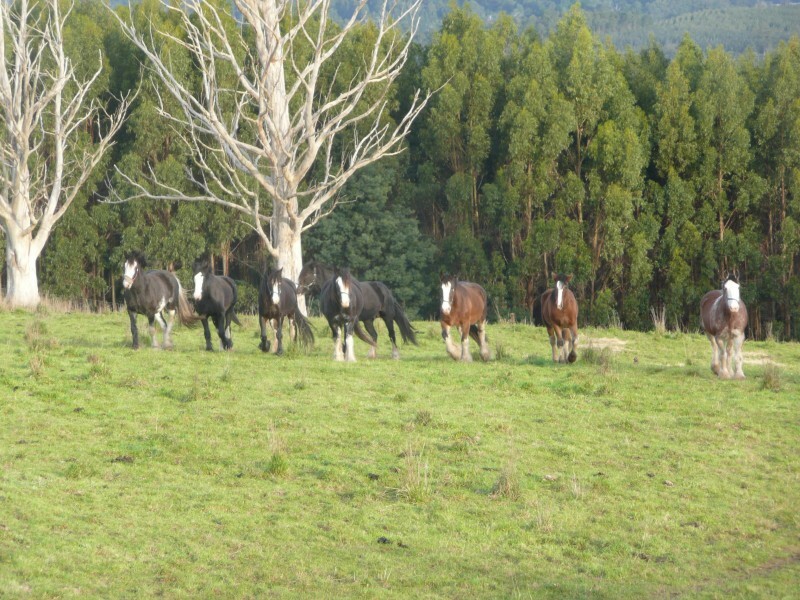 Viewfield Stud is in Tasmania, located at Winkleigh, 30 minutes drive north of Launceston on the western side of the picturesque Tamar Valley. Viewfield is the historical name of the first property purchased by Steve and Deb in 1986. Expansion through the purchase of neighbouring properties in the intervening years has meant that Viewfield now encompasses 360 acres or 146 hectares. Beef production, wool production and prime lamb production are undertaken commercially, with a small amount of strategic plantation forestry for environmental management. Horses are a passion, not a business. Deb learnt to ride during the 1970’s on a bay half Clydesdale, and the soft spot for heavy horses was established. The first foal was bred in 1989, a buckskin clydie cross colt, who was sold as a weanling due to Deb’s own family commitments. He went on to be a terrific harness horse. 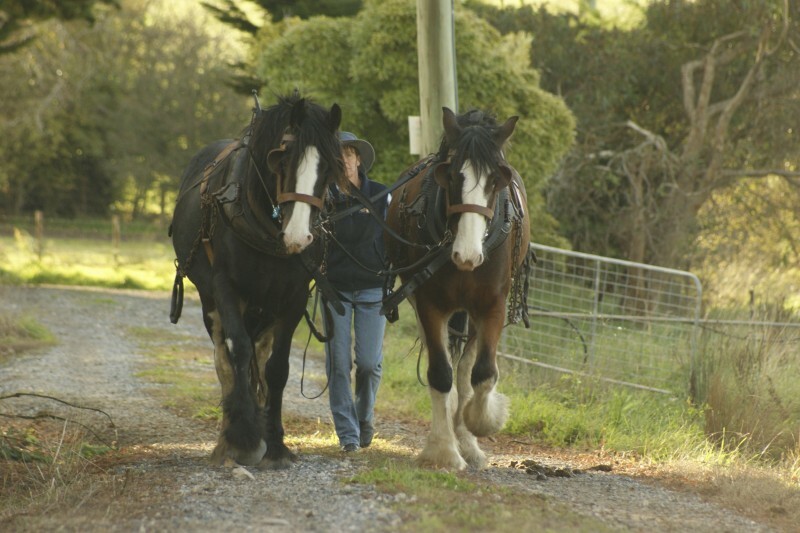 In 1996 the first full heavy horse, a bay unregistered Clydesdale mare, was bought and Deb began the journey of learning how to do agricultural work with a horse instead of a tractor. One Clydesdale soon became two, became three… there was no turning back. Chester’s arrival in 1999 heralded the beginning of the stud. 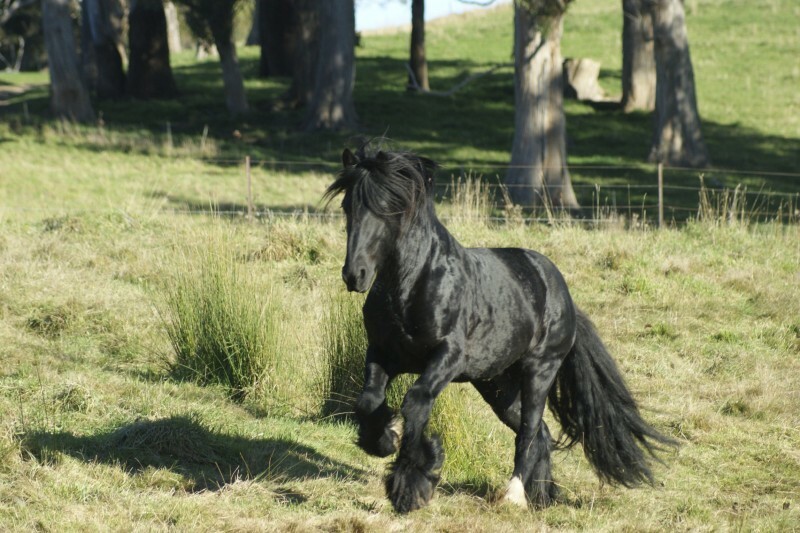 Discovering the Shire breed in 2003 and in particular learning that the Shire Studbook permitted grading up, meant the focus turned from Clydesdales to Shires. The Australian Shire Horse Society announced the commencement of the Australian Shire Horse Studbook in 2007, and Deb became the Registrar. The breeding focus at Viewfield is to produce sensible and reliable horses, with conformation true to the breed standard, which have correct and active action, and temperament, temperament, temperament. Black is a bonus. Viewfield Stud stands Ingleside Dancer, a jet non fading homozygous black stallion out of Ingleside Elizabeth (4 times times best exhibit Sydney Royal) and by Ingleside Might ‘n’ Power. Dan is an affectionate, people loving horse with a fantastic temperament which he seems to pass on to his progeny. He is also educated both to harness and saddle. This spring/summer should see 6 foals produced by him, 1 shire sporthorse and 5 shires. Viewfield mares are carefully selected for conformation and temperament. Before beginning broodmare duties mares are educated either under saddle or in harness (or maybe both) and only if a suitable attitude is demonstrated will they will be bred from. Foals are for sale at weaning each year, and every now and then an older horse becomes available in order to keep numbers under control.